The standoff over Catalan independence from Spain has split not only the region and country itself, but Europe as a whole. Beyond the ongoing pyrotechnics, this issue raises a bigger question: when is it appropriate for a smaller region of a larger geopolitical entity to secede? What criteria should be used to decide the legitimacy of a particular secession bid? These questions are relevant not only for the Catalan situation, but for other regions of Europe where secessionist tensions flare up on a regular basis. The legitimacy of secession has long been a difficult subject for political scientists, theorists and scholars of international relations. Some have likened it to “a moral problem of public international law” (Baer, 2000) in which, as with most moral issues, one person’s ceiling is another’s floor. In the 1990s, in the aftermath of the collapse of the Soviet Union, secession became a topic of heated debate over the fundamental question of “who has the right to govern whom and in what form” (Fabry, 2006) Over the years, two basic positions have gained dominance: choice theory, which posits that there is a general right of secession that all polities are entitled to, as long as it is grounded in the will of the seceding majority; and just cause theory, which says that any legitimate right to secession must be in response to an egregious injury or harm that has been committed against the seceding polity — implying a burden on the secessionists to prove that the originary (“mother”) state’s claim over its sovereignty lacks legitimacy. Both of these positions must convince three different audiences about the legitimacy of the secessionist cause: the local populace of the seceding polity, the populace of the mother state, and finally an international audience of witnessing nations. The “outside world” is a relevant audience, because no seceding nation exists in a vacuum. The breakaway entity must depend on at least some foreign nations and ideally the entire international community (including the United Nations and other international organizations) to recognize its nationhood and be willing to trade and associate with it, perhaps even coming to its defense if the mother country refuses to accept the breakaway. Clearly, the perceived interests of these three audiences are often unaligned. Jefferson then proceeded to lay out the “just causes,” or what he called a “long train of abuses and usurpations” and “repeated injuries,” perpetrated by the “absolute Despotism” and “absolute Tyranny over these States,” aka the British monarchy. To prove the young America’s case, Jefferson claimed that he would “let Facts be submitted to a candid world,” and proceeded to offer a long list of complaints against the British crown covering more than 30 grievances and violations. The most famous of these was “imposing Taxes on us without our Consent,”, but the text also included “plundered our seas, ravaged our coasts, burnt our towns, and destroyed the lives of our people,” “dissolved Representative Houses repeatedly,” “cut off our Trade with all parts of the world” and more. Today, the situation of Kosovo exemplifies one of the best examples of the “just cause” doctrine in action. There, the drive toward independence has been propelled by a pattern of consistent human rights violations, discrimination and violence. It underlines that a “just cause” or “human rights standard” is perhaps the only one that enjoys widespread legitimacy among most audiences as the basis for secession. The various secessions and independence bids that occurred after 1989 and the collapse of the Soviet bloc, whether various polities exiting the Yugoslav Federation or the Baltic and eastern Europe republics leaving the Soviet Union, were widely viewed as founded on a “just cause” principle. While Scotland has its grievances with the UK, including long-standing economic, social and cultural differences, those would be seen by most observers as “normal” tensions between regions and their central government. It is hard to argue that the case of Scottish secession fits the “just cause” criteria. So the appeal would for the most part rely on a “choice theory” rationale. The UK agreed to allow Scottish voters a referendum on choosing whether to stay in the 1707 Union while the European Union and international community did not have to wrestle with the fundamental question of “who has the right to govern whom.” The referendum took place in a calm and orderly manner and, in September 2014, the Scots rejected independence in a process regarded as legitimate by all three audiences: domestic, originary and international. The case of Catalonia, however, lands politicians, as well as scholars and theorists, in a cauldron of controversy. Catalonia also has its list of grievances, many of them culturally and historically rooted. 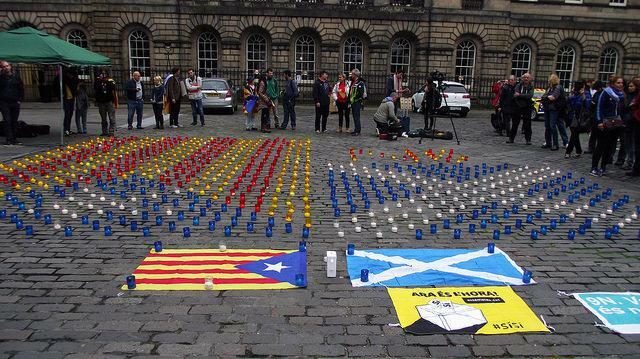 But just as in Scotland, few have argued that those grievances are sufficient to legitimize Catalonia’s secession bid according to a “just cause” doctrine. There were no human rights violations, no plundering of seas, ravaging of coasts or burning of towns. Catalonia enjoys very substantial autonomy in the cultural, linguistic, educational and governance fields. The main substantive grievance is linked to the fact that Catalonia is one of Spain’s wealthiest regions and, like wealthy regions in most federal states, contributes disproportionately to financing the Spanish state. The recent upsurge of Catalan secessionism was driven by the rejection by the constitutional court of a widely-approved agreement that would have given Catalonia greater fiscal autonomy (among other things). 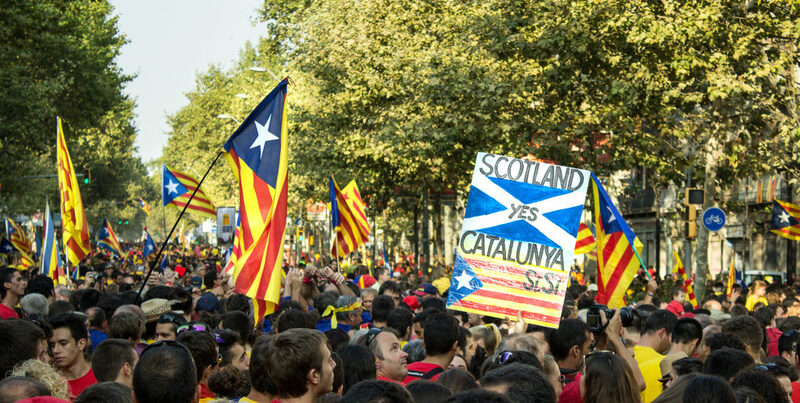 Unlike in Scotland, however, the central government of Spain did not agree to the holding of a referendum. Quite the contrary, it declared the referendum illegal, as did Spain’s highest court. It used the state’s monopoly over the legal use of force to seek to physically prevent the referendum from taking place. (The resultant pictures of police beating citizens seeking to enter polling booths did much to inflame nationalist sentiments and stimulate declarations of solidarity with Catalonia from outside audiences). The barely pro-independence majority in the Catalan Parliament deployed a “choice theory” declaration, asserting a general right of secession conditional only on obtaining an expression of will by a simple majority of voters in Catalonia. The views of the rest of the Spanish populace or the Spanish government, not to mention outsider countries, were not considered relevant. The European authorities, for their part, declared the situation to be an internal Spanish matter to be determined on the basis of Spanish law (which in effect meant they largely sided with Madrid). We need therefore to look more closely at the “choice theory” of secession. Can it alone generate legitimacy for independence movements? What would be the consequences of permitting secession based on choice-theoretic principles in the European context? And if the answers are, respectively, “no” and “substantially negative,” are there any sensible criteria that can be applied to make a “choice theory” rationale more legitimate? Jefferson’s hesitancy reflected a number of considerations that render the application of a pure choice-theoretical standard both impractical and undesirable. The lack of any criteria or requirements for substantive justification means that even the most abhorrent reasons cannot be challenged. When the Southern states in the United States tried to secede in 1860 in order to preserve the immoral and murderous institution of slavery, choice theory implies that their reason should have been respected as a priori legitimate because all reasons are legitimate if supported by most of the home population. In its purest form, it would mean that a majority of citizens within any area or region, even one arbitrarily drawn, could insist upon a right to secession. Without any minority rights guarantees, those opposed to secession (which could amount to up to 50%-1 of the population), would be exposed to very profound changes in their conditions of life against their wishes. And what about the right of a people to change its mind (which has come up in the Brexit debate)? A referendum is a snapshot of opinion at a given point in time. If it leads to secession, can the decision be subsequently reversed? For how long does a vote in either direction bind the affected population? Also relevant is the relative disparities in wealth between different regions. To varying extents, nation-states all have fiscal and other systems that transfer resources from the populations of relatively wealthy regions to poorer ones. This inter-regional solidarity is an extremely important advance within modern states. It helps to ensure the political, economic and social cohesion of the country as a whole, and is inextricably tied into the redistributive function of taxation and social insurance mechanisms between citizens of different income groups and other categories (workers and retirees, the sick and the healthy, children and elderly). In a strictly financial sense, wealthy regions have a material incentive to break out of these bonds, and secessionists in Catalonia, Flanders or northern Italy have all indicated that one of their primary motivations for secession is their belief that they would enjoy greater prosperity without the responsibility of participating in a federal system which shares taxes and appropriations. Permitting the secession of wealthy regions on a simplistic choice theory principle would thus seem to pose a grave threat to redistributive mechanisms within nation-states. The impact could be realized well before actual independence, as countries keen to keep the lid on an independence movement springing up in a wealthy region are incentivized to reduce the degree of redistribution as a way of placating voters in that wealthier region. For all these reasons, a simplistic choice theory approach – a simple majority of any area’s voters suffices to legitimize secession — seems both unworkable and undesirable. Jefferson’s political instincts in that regard are as relevant today as they were in the late 18th century. The issue of EU membership adds an additional layer of complexity. Currently, irrespective of whether secession is agreed to or not by the originary state, the new state is not automatically granted EU membership. Moreover, under EU rules, new membership requires unanimity of existing members. So, a mother state opposed to secession can use the threat of an indefinite veto of the former region’s membership bid to exert pressure (some would call it blackmail). The EU itself could see its geographic continuity permanently disrupted, as membership bids by breakaway regions are vetoed by their mother nations, creating non-EU states across the continent, like the holes in Swiss cheese. For this reason, some commentators, notably Ulrike Guerot, have suggested as part of a proposed European Republic abolishing the right of veto, enabling regions to secede without losing EU membership. This, it is claimed, will help take much of the bitterness out of secession debates. Moreover, it is argued, that the EU (and the monetary union) would be more democratic and successful if they were not dominated by a handful of member states that are much larger in population and resources than all the others, so making secession easier could eventually result in a more level playing field of similarly-sized states. We have sympathy toward such a long-term vision of EU membership, with a Europe composed of a strong centre and many more or less equally-sized regions that can each preserve a distinct identity within a union in which member states and a European-level government have a more traditionally federalized relationship. Certainly, it is possible that a downsizing of larger member states via the secession process would help deal with the big state-little state conundrum that currently vexes the EU. However, we have some serious doubts about how implementation of such a plan might proceed. For a start, would secession only be permitted for the larger member states? Would regions in smaller states (such as Flanders in Belgium) be automatically denied? And if Italy allowed its north to secede, and France and Germany did not similarly downsize simultaneously, wouldn’t that exacerbate the big state-little state disequilibrium? The process for turning this vision into reality is hard to imagine. As with the young America, the solution to this problem might not be to split up its bigger states but to create a bicameral legislature in which representation in one house was based on population and the second house on equal representation, regardless of size. Moreover, there are different and even competing democratic principles and ideals. From the viewpoint of an “egalitarian ideal,” having all member states of the same size would seem to be advantageous. But in terms of effective governance, there is another ideal that values efficiency of institutions and popularity of outcomes. Effective governance is also extremely important for democratic legitimacy. A union in which there are not only many member states, but also in which those member states could be in a frequent state of mitosis, splitting apart into ever-smaller units, risks reaching a stage of complexity to the point of instability. Quite apart from whether the “right” regions break away, there is the question of how to pair that process with the necessary greater centralization of powers at the EU level, evolving into a successful European Republic, as in Guerot’s vision. If these different processes do not occur in tandem, the result could very well be less, not more, integration. If the choice theory of secession were to prevail in Catalonia and snowball in other regions of Europe, it would act as a force for undermining the goal of an ever-closer European Union. Already, the EU’s governing efficiency and accountability have been impacted by a timidly federal structure which gives great weight to consensus decisions, double majorities and other safeguards. Its 28 (soon to be 27) members already produce a frequent cacophony without the added pressure resulting from a number of breakaway republics (even assuming seceding regions and their former mother states “get on” after their divorce). It is not hard to envision the chaos that could ensue under such fragmenting circumstances. Under real-world conditions then, the threat of permanent exclusion from the EU acts as a check that serves to restrain regions which are flirting with secession; it acts as a brake against the notion that any sub-national region or polity (whether arbitrarily drawn or not) that can muster 50% plus one vote at any point in historical time, can exit not only an EU member state but the EU itself. It seems to us that this threat of exclusion is a certainly second-best but necessary brake on what would otherwise become a too-simple and overly zealous application of the choice-theory principle that would likely have disastrous consequences. We have seen that the idea of legitimate secession raises hugely difficult questions, and reasonable people will disagree on the answers. There are many shades of grey and different cases need to be evaluated on their merits. The current procedures and philosophy regarding secession, as exemplified by Catalonia, are highly unsatisfactory and potentially dangerous. What is needed are criteria that are widely seen as legitimate for secession within the EU. Such grounds must clearly go beyond a mere expression of majority will, yet in certain justifiable cases they may fall substantially below that of egregious rights violations (which thankfully are highly unlikely to occur in a modern EU state). One such criterion might be when a dramatic change of relationship occurs between the originary state and the secessionist region. A real-world illustration would be that of Northern Ireland or Scotland seeking to secede from the UK following Brexit. When the UK exits the EU, it will drag the two regions (which both voted to remain) out of the EU. That will greatly affect the Scottish and north Irish economies and their international relations (especially with the Republic of Ireland, with which Northern Ireland shares a long border and a complex and conflicted history). A requirement to show a substantial and long lasting (i.e. not merely temporary) majority in the territory concerned; this could involve for instance at least a 60% voting threshold for passage in any referendum; as well as a certain minimum voter turnout threshold in order for the referendum to be valid. Agreement between the breakaway region/country and the existing member state on a reasonable financial settlement (which could be brokered by the EU) regarding public debts, social security financing, and other previous financial commitments. Particularly in the case of wealthy breakaway regions, more rigorous conditions for a valid independence claim should be required to ensure that the state left behind does not suffer a dramatic loss of wealth and standing. At the same time, the EU should strive to design mechanisms such that any increase in the number of member states resulting from secessions automatically leads to institutional changes that ensure the continued effectiveness of decision-making. The direction of reform steps must clearly be in the direction of increasing the weight of one-person-one-vote and improving and enhancing EU governance. Examples include greater population-proportionality of European Parliament seat allocation, increases in the size of blocking minorities in the European Council, and moves from unanimity to qualified majority voting. The European Union should create criteria for a rational and forward-looking foundation for secession of regions, just as it has created criteria for admitting new member states. Indeed, secession is a subset of member state formation, and the EU should not fear it. Rather, it should place it on a substantive foundation that will enhance the European continent’s richness and diversity. A rational discourse about regional identities and economic, social and cultural interests could be a source of strength, draining away much of the peril from the current fractious secession conflicts. If such a rational process led to a reduction in the average size of larger member states, that could facilitate more fundamental institutional reconfigurations. For example, the European Council could become a second chamber in a much more federal system, leading to more effective decision-making structures for the European Union. With much of the drama and regional partisanship taken out of the “to-secede-or-not-to-secede” question, people might well decide to stay where they are, in national terms. Seen in this light, the question of a greater or smaller number of Member States is secondary. In an uncertain world dominated by large players like the US, China and India, the overriding emphasis must be on ensuring and enhancing the effective governance of the European Union as an ongoing forum for the member-states of Europe, facilitating the debate over differences and hammering out of policies that have the potential to move forward in a progressive direction. A rational secession process could make a contribution toward that end. The EU already has a rational framework. It goes like this: a separatist movement has to work within the existing legal framework. What happened in Catalonia was a coup attempt, plain and simple, and the EU were right to give it short shrift.